With an anticipated crowd of seven lakh, prime ministerial hopeful Narendra Modi’s rally in Bangalore today is being touted by the Bharatiya Janata Party as one of the biggest the state has seen and, if the numbers back it, Modi’s third biggest so far. Modi had already visited Karnataka earlier this year, before the assembly poll but this rally would be the first in the state after he was “anointed” prime ministerial candidate, which is why the party is pulling out all stops, says MLA and party spokesperson Suresh Kumar. “It may become the mother of all rallies in Karnataka,” he adds. 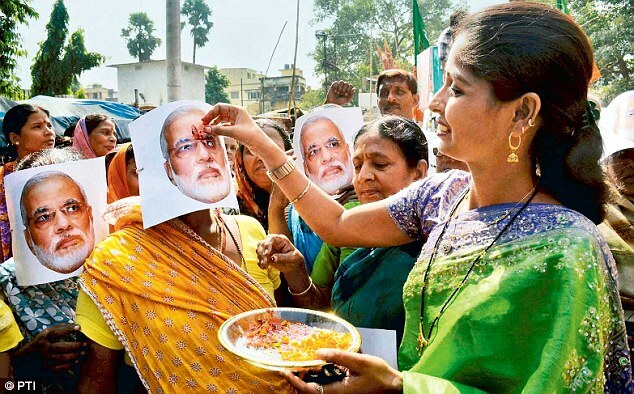 Cutouts, banners and hoardings of Modi have been put up in different parts of the city, announcing the date, time and venue and exhorting people to turn up in large numbers. In the basement of the party’s four-storey saffron-and-white headquarters in Malleswaram, the traditional, conservative heart of Bangalore, T-shirts with Modi’s photo and accompanying enthusiastic slogans are on sale. These will also be available at Palace Grounds, the sprawling ground where the rally is to be held. Upstairs, various discussions are under way, including one about deploying unmanned aerial vehicles during the rally. This rally, says Kumar, would be the first in the state where people have been asked to buy coupons of Rs 10 each to attend, though it is not compulsory. “This is to counter the allegation that a lot of people who come for political rallies have been hired, or given incentives,” he says. By Wednesday evening, they had sold nearly 400,000 coupons, he claims. People can also register online through the state party unit’s website – log on and a smaller window pops up, with Modi’s face and the slogan “Bharatha Gellisi”, roughly translated as “Make India the victor”. Though there are at least six months to go before the great battle of 2014, rally season has started in full swing, aided by the fact that Assembly polls are currently under way in four states. Each party tries to outdo the other in terms of scale, size and speeches and Modi’s Bangalore rally will be no different. Last Sunday, Haryana Chief Minister Bhupinder Hooda held a massive rally at Gohana which, according to a party spokesperson, attracted a crowd of over 14 million. 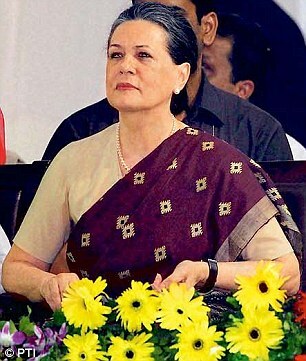 “This was our biggest show of strength to date,” says Shiv Bhatia, media advisor to Hooda. The rally was described as “a sea of pink”, a reference to the pink turbans worn by supporters, and as an attempt to cast Modi’s own rallies into the shade. Organising a rally is a complex task, and the most important factor for a successful one is the party cadres, whose job it is to spread awareness and ultimately, convince people to show up. The person close to Hooda quoted above underlines that while charisma of the speaker is also critical, cadres play the most crucial role, along with other arrangements such as transport and logistics. 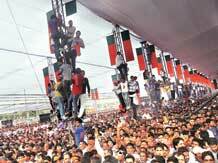 Apart from booking the venue, other preparations usually begin 15 to 20 days ahead of the actual date of the rally. Preparations for the Modi rally, Kumar says, began three weeks ago when the date of the rally was finalised, with workers visiting homes in their constituencies as part of a mass public contact programme. “We expect at least a few representatives from each of the 44,000 polling areas in the state to be present at the rally,” he says. About 35 committees have been formed to look into various arrangements – from publicity, decoration, traffic and parking to food, lighting and sound. For Modi’s rally on Sunday, too, about 60-70 per cent of the transport is being taken care of by local leaders, says Kumar. “Fifteen trains have been booked to bring people from areas like Gulbarga (in north Karnataka) and about 2,500 buses have been hired. In Bangalore, we have sought permission to use 3,000 buses, which has been granted,” he says. This is in addition to smaller vehicles like Sumos, and 1,000 sympathisers who are supposed to arrive from Mysore on foot. The cost for the remaining 30 per cent will be borne by the party. Eleven choultries near the railway station have been booked and a mutt near Ramnagar has offered its premises to those who are attending. Elaborate arrangements have also been made for refreshments. “We have constructed six mega kitchens, each of which can cater to 60,000 people. There are 100 counters in each block, with each headed by a separate team. The menu, however, will be common,” says Kumar. Of course, none of this comes cheap. Kumar himself says a conservative estimate for the rally’s outlay would be Rs 7 crore though other reports quote the actual figure to be closer to Rs 20 crore considering the expenses involved, which will include a helicopter to ferry Modi from the Hindustan Aeronautics airport to Palace Grounds. The expenses are met by donors, party workers and well-wishers. Some of the donations were in kind, such as grain and vegetable. Donors also lease out a choultry without charging for it, says Kumar. Another aide of Hooda estimated that his mega rally in Haryana would have cost around Rs 4 crore, even though it was a “basic” rally, without a shamiana, or other trimmings. Once the electoral code of conduct kicks in, each Lok Sabha candidate has an expenditure ceiling of Rs 40 lakh though the Election Commission is contemplating raising this to Rs 50 lakh, according to a recent report in The Economic Times. But setting aside the question of the numbers that turn up, whether 400,000 or 1,400,000, does it translate into votes? “Political rallies represent a number of realities, the first being the efficiency of the political machinery and motivation levels of the cadres. This is a fairly important aspect and an indicator. It does reflect the novelty of the speaker or charisma, and certainly this does in this sense reflect momentum. But while it is hard to create a causal relationship between vote share and strength of rallies, these do reflect the state of the current mood and also the capacity of the party,” says Samir Saran, senior fellow and vice-president of Observer Research Foundation. Speaking about Hooda’s rally last Sunday, Bhatia says the turnout was naturally a reflection of the party’s and the leader’s popularity, considering they had come to see the leader of a government that had been in power for nine years. Commenting on the tactic of selling coupons of Rs 10 to those attending, Saran termed it a clever tactic. “They are making stakeholders out of the portion of the attendees who are not converts already and for the others, it creates a sense of ownership as well. But this is a novel proposition and the outcome is yet to be seen.” The BJP had introduced the coupon strategy first at its rally in Hyderabad, where they were sold at Rs 5. This was increased to Rs 10 at their rally in Trichy in Tamil Nadu, a state where the party strength is negligible. The Congress has so far refrained from going down the same path. This is, of course, just the beginning of election season. There are eight more Narendra Modi rallies planned in Karnataka alone, before the 2014 polls, and the party is targeting 100 all over the country. And with good reason. “In a country where TV homes and Internet are still fairly sparse – political mobilisation and messaging is still delivered and achieved through such direct campaigning like house calls and rallies,” says Saran. According to World Bank estimates, India and China together account for more than 700 million Internet users. Citizens in both countries have embraced the digital sphere enthusiastically, and mobile phones and the Internet are the preferred platforms for anything and everything, from expressing opinions to conducting business. 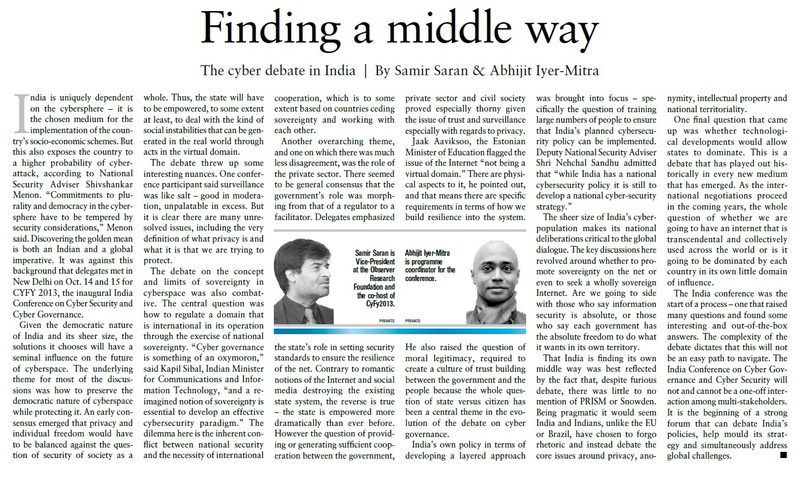 Indian and Chinese stakes in cyber governance are already significant, and are only likely to increase as both continue connecting even the most rural hinterlands, which still suffer from lack of efficient physical connectivity. Much future global wealth generation will be deeply integrated with the online sphere on account of access to new markets, online supply chains, services and Internet-based financial flows. Hence, India and China, as they seek to raise the incomes of their citizens, will need to transform into sustainable and secure digital economies. Digital governance, norms and rules, and International conventions must see India and China as rule-makers and not rule-takers. The West, in the wake of the Edward Snowden revelations, is witnessing a new wave of support for discussing and negotiating a certain “code of conduct” for this global commons. Although the current discussion is more on privacy and surveillance, there are other aspects that must also be vigorously debated. The region’s success and prosperity are so closely linked to its successful integration that a divided digital domain may be detrimental to the region. In fact, both India and China must learn from their predicament of dealing with the border legacy, and should ensure that discussions on cyberspace are not held prisoner to old notions of boundaries and rigid ideals of statehood. The common prosperity of the two nations is linked to the digital future, and even lifeline provisions such as social security schemes, health and education among others are likely to be delivered through virtual means. Therefore, it is important for India and China to ensure that the world does not witness the birth of “digital sovereignty” where states contest, or of “digital capitalism” where commercial interests prevent this medium from being a global commons. There are certain historic biases already. Technology, services and access reside with Western corporations and in Western capitals. The Internet must remain technology and geography-agnostic. Any global architecture for both hardware and software must ensure this. Despite these converging objectives, the conversations between India and China on this subject, much like in other sectors, have been limited and impeded by suspicions and historic security concerns. It is time that the two nations go beyond these. China seeks to be an influential player in telecommunications and the digital economy in India. And Indian IT companies are looking for a more hospitable environment. A positive atmosphere and confidence building are a must for realizing these ambitions. In fact, Indian and Chinese companies can jointly lead the way in providing hardware and software solutions to developed and developing economies across the value chain. To create an environment conducive to business and in order to shape an Asian discourse on cyber governance and cyber security, the two governments must seriously consider the following ideas. One possibility is to create “cyber hot lines” between nodal agencies, such as between the Computer Emergency Response Teams in the two countries. They should also establish mechanisms for threats and vulnerability reporting and sharing information on gateways and access codes where required. The two sides can also discuss responses and solutions to counter hacking and malware that threaten economic operations and businesses between and among parties in the two countries. Experiences on protecting critical infrastructure should also be shared. And, finally, they need to undertake joint development of low-cost digital access to, and affordable technologies for, the underprivileged segments of society.